It was fully ten years since I had last cycled this way. Not much had changed, as you may imagine. The church is still marooned in its neat little graveyard, a hundred yards or so from the nearest road, and so I got off my bike and pushed it up the path - not from fear of meeting anyone coming the way, I hasten to add, but because I wanted to savour the serenity of this enchanting place. However, the large medieval structure now in use as a barn in the farmyard to the south of the church shows that this was not always the silent, remote spot it is today. Until the Reformation, there was a large priory here, and the surviving building was probably its refectory. The church was appropriated very early on, and served jointly as parish church and priory chapel. 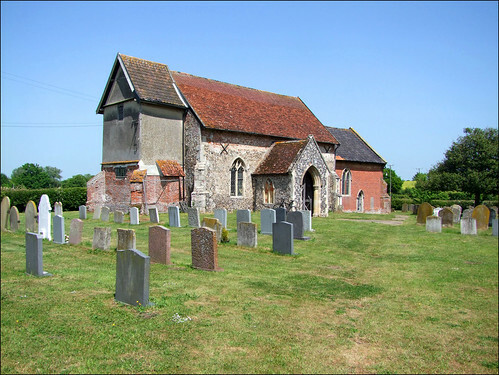 Curiously, this church is built almost entirely of red brick, the only one in Suffolk of its period that I know. The nave is rendered, the tower truncated, and the chancel renewed; but, there it is, a red brick medieval church. The truncation to the tower is capped in a pleasingly rustic manner, and there is an interesting memorial set into the south nave wall for a member of the Garneys family, who we have also met at Kenton. It remembers John Garneys, who died in the winter of 1697, and was put in place by his grandson Clere of Hedenham in Norfolk. The Victorians were busy here, and not much has happened since. There is a feeling of being perfectly poised between the 19th Century with its manners and heirarchies, and the more mysterious ancient, rustic heartbeat of Redlingfield down the long generations. The lack of coloured glass fills the interior with light, and the overwhelming sense is one of simplicity. There is a good 15th century font, although the lions and wodewoses around the stem have had their heads battered away. There is a large piscina in the nave south wall. One thing I remembered from ten years ago was that this church has taken its dedication to heart, and the community have decorated its walls with pictures and icons of St Andrew. There is a St Andrew flag to the west, and even a greeting from Prince Andrew framed in the porch. St Andrew is a popular Saint in Suffolk, as he is in all maritime counties, but I'd not come across anything like this in an Anglican church before. However, I couldn't see the fishing net, complete with cork floats, which I'd seen on a bench at the back ten years previously. Perhaps it was a relic. The old Redlingfield village sign stands in the porch: there is a new one at the junction a couple of hundred yards to the north of the church. The porch also contains the village stocks - they are hidden beneath a bench in the porch, and you might miss them. They contain two sets of four holes, set some distance apart, as if the prisoners might not prefer each other's company. Mortlock reminds us of a sad story of the monks and nuns of Redlingfield, which struck a chord with me at the time because I was reading Hilary Mantell's utterly compelling Wolf Hall, a fictionalisation of the life of Thomas Cromwell. At the dissolution, the members of the community were given twenty four hours notice to leave, and turned out into the world with not much more than their faith to keep them company.